After four continents, 17 races and 1,018 miles, it all comes down to one 30-lap shootout at Valencia to decide the 2013 MotoGP world champion. Could things be teed up any better? 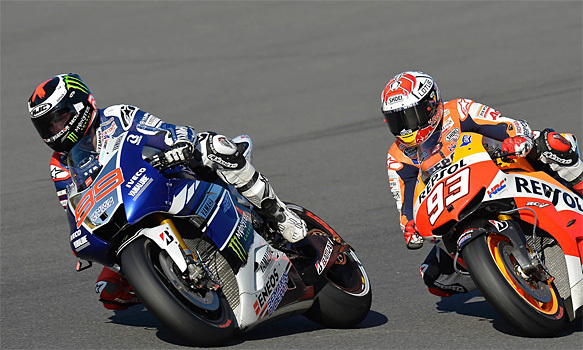 Not only will the title go down to the final round for only the second time in two decades, but we have Jorge Lorenzo pitted against Marc Marquez; defending champion against rookie upstart; Yamaha against Honda. The only certainties are a sell-out crowd and a Spanish coronation. 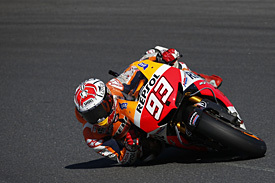 From early summer, Marquez has been on course to be crowned the youngest world champion in premier-class history, and only the second rookie to take the title. Kenny Roberts Sr remains - for a few days more at least - the only man to have achieved the latter feat in 1978, but at 26 he was arguably far more experienced. On Sunday, Marquez will still be over two months shy of his 21st birthday. His immediate fit with Honda's RC213V has been a joy to witness. Full of joie de vivre, always smiling and always happy to sign autographs for fans late into the night, he has made the transition look seamless. It's been a bit – well, beyond his wildest dreams. Marquez's confidence and pace has been breathtaking all year, and I remind myself of my colleague Neil Spalding saying after the November 2012 Valencia test – the Spaniard's first official MotoGP outing – that "Marquez is so quick for his first time on the bike, I almost think he's secretly ridden it before somewhere." Many put bets down he would win the title in 2013 before the bookies woke up to MotoGP's swashbuckling new arrival, but many others – including me – thought he'd have a few accidents, with one of them being a biggie that would dull his pace for two or three grands prix. Valentino Rossi crashed out early on in his rookie season, and Dani Pedrosa likewise had some rookie wobbles early on too, but I really expected Marquez to have a whopper, like Lorenzo at Shanghai in 2008. The accidents have come, most notably at Mugello when he got caught out braking from 223mph and fell while doing a mere 209mph. Somehow, he was lucky enough to get away with it. In the next session he was back out on track. At that moment Honda probably had the better bike by a whisker. Lorenzo had won the first race, with Rossi completing the Yamaha fairytale by finishing second on his return to the team, but it was a false dawn for the men in blue and white. I sat with Yamaha Motor Racing's managing director Lin Jarvis after that Qatar opener and he showed me a results sheet from the race with a scribbled note from Lorenzo along the lines of 'we can do this; we can win this'. Lin couldn't stop smiling that night, and I'll always remember that piece of paper as proof of just how much drive and fight Lorenzo possesses. And while the two-time world champion did indeed start strongly, his season turned when he crashed in a wet second practice session at Assen. Shuttled back to Barcelona that night and operated on in the early hours, he was cleared to ride with a plated collarbone just 48 hours after his crash. Remarkably, he finished fifth – surely one of the great sporting recoveries in modern times? The salvage job took another blow however: he crashed again on Friday afternoon next time out at the Sachsenring. There was no miracle this time: he was forced to sit out the race, while Marquez – who also benefited from Pedrosa's injury-enforced absence – took victory...and then repeated the feat over the next three races. In the meat of the season, Marquez dominated, scoring 100 points to Lorenzo's 36. The season swung again though in a dramatic British Grand Prix. Marquez fell in the warm-up, dislocated his shoulder, and yet hours later not only lined up to race but even led going into the last corner. That was when Lorenzo made his 'nothing-to-lose' move, pulling off a truly inspired pass to claim victory and set up an irresistible run of form. Over the past six races Lorenzo has outscored Marquez by 36 points – a total of course inflated massively by Marquez missing his pit board/being unable to count to 10/trying to be a little too clever in a bizarre and tyre-affected race at Phillip Island. So who will crack? Who will flourish under the pressure of a one-race decider? Personally, I really don't know, and I say that in part because Valencia can be an odd place in the middle of November. The past two visits to the Spanish circuit have been hit by rain, while last year Pedrosa started from the pitlane but went on to win, with a CRT bike leading the race early on. Marquez, of course, won from the back of the grid in an extraordinary Moto2 finale. There is the Spanish pressure, too. Home races are enough of a hassle for the riders, but when there are four of them in your home country – and this one is the championship decider – you have to favour the experience of Lorenzo. He's made silly mistakes before and learnt to cut them out (Sachsenring 2013 aside). Marquez meanwhile will need all the advice from the wise owls at HRC to move on from this year's Phillip Island mess-up. No stuck throttles, no engine bolts falling out, no fuel breather pipe clips left on after the grid and no TV transponder boxes flapping around – there will be many in pitlane quadruple checking their work this weekend. And there's a third factor to consider: Pedrosa. He wants to win as much as the next guy, and has previous form here, having triumphed in 2012, '09 and '07. And this time he'll have no guilt complex compelling him to help his team-mate, as was the case back in 2006 with Nicky Hayden. What about the machinery? For all the talk of Honda's superiority, it was Lorenzo and Yamaha who won at Motegi, supposedly the most Honda-friendly of tracks. The quick-shift gearbox Yamaha brought in at Misano has made Lorenzo happier on the bike, and looking at his scores since then it made a massive difference on the championship sheet, too. Valencia may be cold and that may suit Lorenzo too, with his typical strategy being to attack early and establish both heat in his tyres and an early lead (a win-win dynamic). 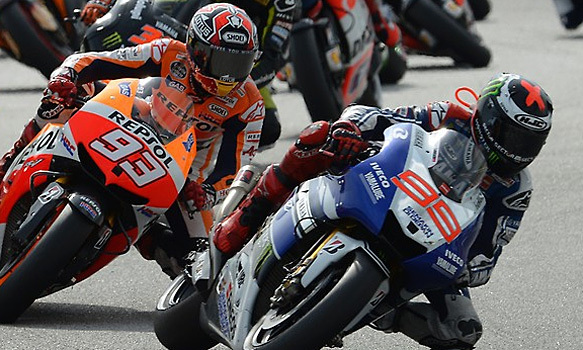 Conversely, the Honda has more leap out of the last corner, meaning Lorenzo could be vulnerable on the straight. Around and around we go. Ultimately, the deciding factor could be Marquez's still healthy 13-point advantage. You get 13 points for fourth – 12 less than the winner – but ultimately the permutations are endless and will shake out on the day rather than in this column. If it's a wet race on Sunday the pit boards of both riders will have to be very clear indeed. Maybe some four-foot-high fluorescent green lettering will be needed. I kid you not. Whatever shakes out at Valencia, one guy on Sunday night is going to be very, very disappointed, for it has been a classic season in which both men balanced mistakes with epic victories. The question is: who has the sheer speed and who has the experience for the pressure on Sunday? No. Still can't split them.